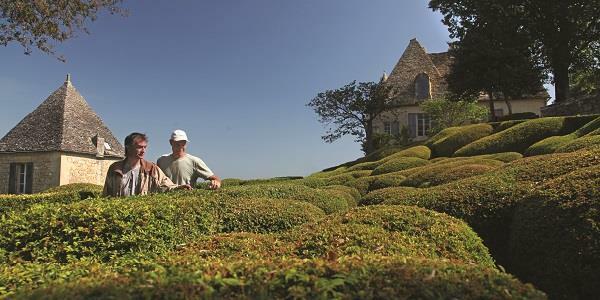 The Dordogne: a visit to the Gardens of Marqueyssac is a MUST! Whatever the time of year, visitors to Constant in the Dordogne rightly marvel at the gardens surrounding this ancient hamlet, now a beautiful (and beautifully appointed) holiday village. Serious attention has been paid to the landscaping and upkeep of the surrounding acreage, and holidaymakers delight in both the formal gardens and – depending on the season – the profusion of sunflowers in the field that fronts the development. Though even in autumn and winter – not ‘sunflower season’ – there’s always much to enjoy. But while nature gets more than a look-in, the site’s gardeners, Benoît Laurent and Olivier Vergine, are French; and at heart they favour they favour the formal style so beloved by renowned 17th-Century landscape architect André Le Nôtre and his contemporaries. And that means one thing above all else: topiary. And the kind of topiary to be found at Les Jardins Suspendus de Marqueyssac, about 30 miles from Constant, is a bit special. Built to enhance the pleasure of walking, the hanging gardens of Marqueyssac are the work of several generations of the same family, owners of the Château de Castelnaud estate since 1692. Their origin dates back to the École Le Nôtre (yes, André of that ilk). At the end of the 19th Century, Julien Cerval, back from Italy, dedicated himself to the beautification of Marqueyssac, borrowing liberally from Le Nôtre’s design principles. He planted tens of thousands of box plants to shape, and in many ways, preordain, numerous nature walks. To accentuate the scenic beauty to the front of the family seat, he created meandering walkways, gazebos, rock gardens, dry-stone huts and places of rest and meditation. Meanwhile Périgord wildlife is well represented in the Pavilion of Nature, whose aviary and strolling peacocks (not native to the region!) are there to complement the walks. Open 364 days a year, the Marqueyssac gardens are a perfect source of inspiration for Olivier and Benoît, who visit a few times during the year to get some new ideas of what they can bring to the gardens at Constant. The gardens are open every day except Christmas Day: from 10am until 6pm in February and March and from 1st October to 11th November; from 10am until 7pm in April, May, June and September; and from 9am until 8pm in July and August. Entry costs €9.80 for adults, €4.90 for children between 10 and 17 years, and under-10s are free. Entry to the château carries an additional cost, as do the ‘Candlelight Evenings’, every Thursday from dusk until midnight during July and August. Further information can be found by clicking here.